Andy's a bartender on Chicago’s West Side in the late 1970s. For years, he's been slinging beers to corrupt cops and fat Zenith employees, but given the neighborhood's ongoing decline, he's starting to wonder how long it can go on. He's serving workers from a dying factory in a dying neighborhood; he sees crime on the rise—and he decides to become a criminal himself. 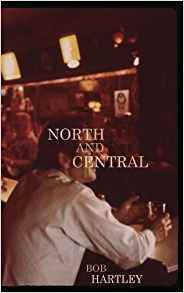 North and Central perfectly evokes Chicago in the epic winter of ‘78-‘79—the bleak season of blizzards and disco and John Wayne Gacy—capturing the city in microcosm through the denizens of one blue-collar watering hole. If Springsteen and Bukowski had teamed up to write a story about a Chicago bar, they'd have been hard pressed to do better than this; it's an anti-Cheers, a bittersweet story about a place where everybody knows your nickname, and they're tired of you coming around because you're a degenerate. But it’s also lovely and beautiful, a gripping and moving story destined to earn its own place among the classics of Chicago literature. Gritty daily schedule of a Chicago bar loaded with real characters and thick with a smoke haze. Andy the barkeep is wise, cynical and pretty sure he's going the way of the dinosaurs. The 70's brought back with aplomb. Pour me another Old Style. Is there a Chicago School? North and Central belongs on the shelf alongside Sister Carrie, Studs Lonigan, Native Son and The Man with the Golden Arm, works that truthfully portray the grit of Hartley's favorite city (and mine). Bob Hartley was raised on the West Side of Chicago. He holds an MFA in fiction from the University of Pittsburgh. His first novel, Following Tommy, was published in 2012 by Cervena Barva Press to extremely favorable reviews. He has been, among other things, a writer, actor, singer, teacher, bartender, mailroom clerk, and washer of soap molds. He currently makes his living as a respiratory therapist and lives in Pittsburgh with his wife and two children. Slow and steady wins in the end, even in the publishing industry. Tortoise Books is dedicated to finding and promoting quality authors who haven’t yet found a niche in the marketplace—writers producing memorable and engaging works that will stand the test of time. Learn more at www.tortoisebooks.com.